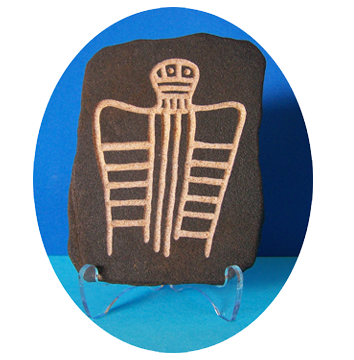 Hand carved sand stone Holy Ghost Panel Floater petite petroglyph/paperweight. Replica of a panel that is part of the Great Gallery found in Horseshoe Canyon at the Canyonlands National Park. The figures are of the Barrier Canyon style and are thought to have started out as paintings that were later pecked out. The largest figure in the panel is about 6 feet tall. Let your imagination be your guide. Approximate size 4 3/4 x 3 1/2 x 1/8 inches. Acrylic stand included with all sandstone paperweights! All pieces are signed and dated by artist Ron White.